Here is the basic layout of the battery system I use on my SR7/582. 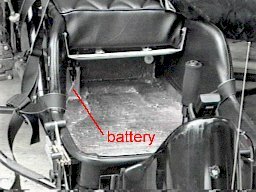 This is the same basic set up used on small motorcycles, garden tractors, and other small vehicles. The yellow and the yellow/black wires from the Rotax 582 put out between 6 and 60 volts ac. These wires are attached to the ac inputs on the regulator. It doesn't matter which one goes to which input. Fuses are generally not used between the engine and regulator. The regulator I used is actually from a Kohler garden tractor engine (because it was free). Any standard regulator/rectafier should work. If you use a 3 phase regulator, just leave one of the ac terminals on the regulator empty. The regulator usually has only one output terminal marked +. The case is used as the negative connection. The connection from the regulator to the battery + terminal should be fused at 10 to 15 amps. I use an in line mini blade fuse holder and fuse from an auto parts store for all fuses shown. All fuses should be as close as possible to the battery. The wires from the regulator to the battery should be at least 14 gauge. Rather than ground everything to the frame of the PPC, I ran a ground wire to all accessories. If your strobe is ac powered, hook the strobe between the engine and regulator. The tack sensor lead for the EIS will only work on one of the ac leads from the engine to the regulator, so if you finish wiring your machine, and find the tack doesn't work, just connect it to the other ac wire. The battery is a 12V lead acid motorcycle battery of any convenient size. The size designation for the one I used is 12N5-3B, $16.00. 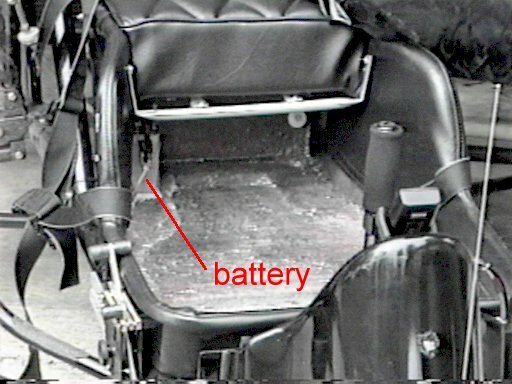 The gallery page shows how I mounted the battery under the seat. Wherever you mount your battery, make it easy to get to for filling, and don't forget to hook up the overflow tube.